LAS VEGAS, Aug. 8, 2016 /PRNewswire/ -- Caesars Entertainment Corporation (Nasdaq: CZR) -- In honor of its 50-year legacy at the center of the Las Vegas Strip, the iconic Caesars Palace celebrated its golden anniversary with an opulent birthday pool party, featuring a five-tier cake, champagne toast and a 10 minute fireworks extravaganza hosted by award-winning chef Gordon Ramsay. The anniversary festivities continued on Saturday, Aug. 6 with a once in a lifetime gala headlined by world-renowned entertainers Tony Bennett, Jennifer Lopez, Howie Mandel, Wayne Newton, Donny & Marie Osmond, Matt Goss and The Righteous Brothers. Special Icon Awards were also presented to honorees that have helped shape Caesars Palace's rich history, including Calvin Harris, Gordon Ramsay, Celine Dion, Elton John, Jerry Seinfeld and more. "During the past five decades, Caesars Palace has set the standard for the Las Vegas experience," said Mark Frissora, President and CEO of Caesars Entertainment. "Tonight not only do we thank our great entertainers and world-renowned chefs but we say a special thank you to our customers, employees and community partners for helping to shape our rich history and our bright future." As Caesars Palace first opened its doors on Aug. 5, 1966, the celebratory weekend kicked off exactly a half-century later on Friday, Aug. 5 with an evening pool party for hotel guests at the picturesque Garden of The Gods Pool Oasis. 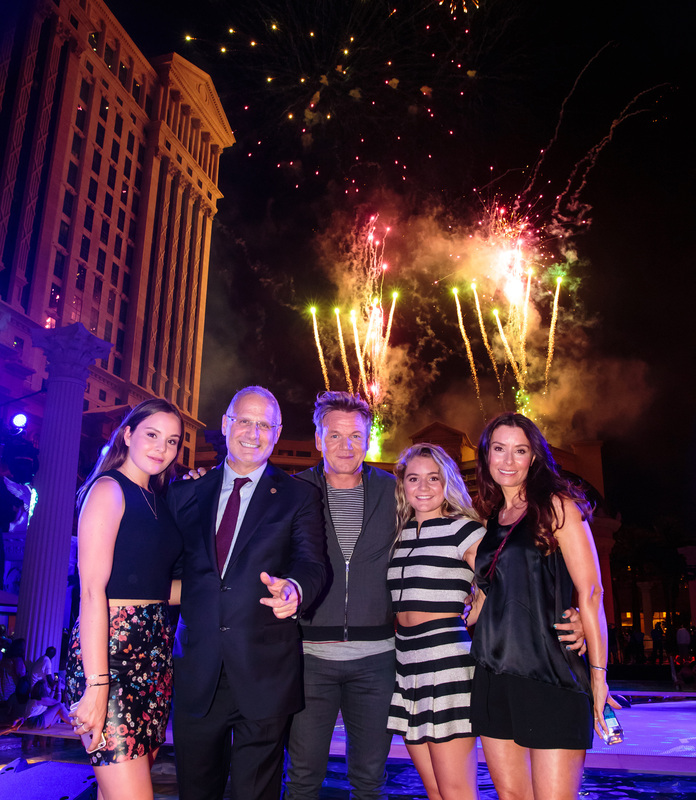 Host Gordon Ramsay led the birthday champagne toast and cake cutting with nearly 3,000 guests. 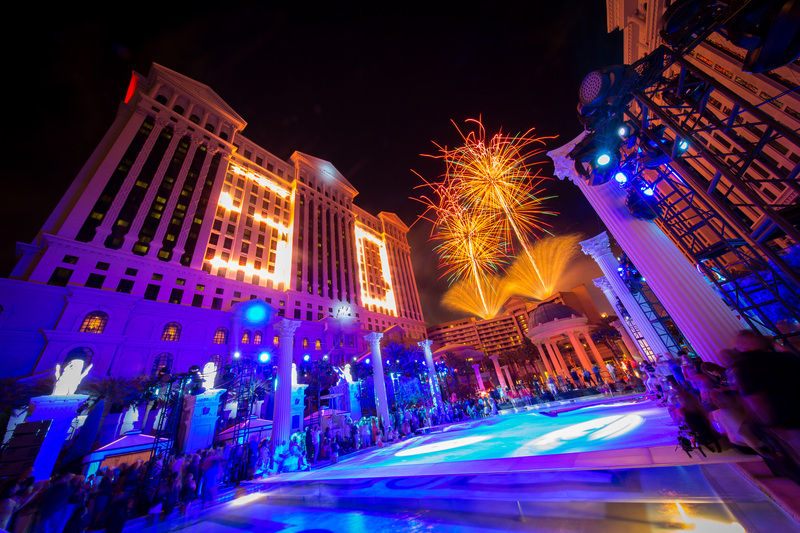 Poolside guests and crowds outside the resort on Las Vegas Boulevard admired the 10-minute anniversary-themed fireworks show above the re-imagined Julius Tower at Caesars Palace. Cocktail servers dressed in bubble costumes poured glasses of champagne for guests surrounded by special lighting and an art display with ping pong balls in the Neptune Pool. Live entertainment included a performance by a roller-skating duo from ABSINTHE and DJ set by OMNIA Nightclub resident Mark Etson. The poolside celebration concluded with the announcement of the 50th Anniversary nationwide cocktail competition winner. J.R. Starkus of Las Vegas created the Lazy Stroll, made with Plymouth gin, Cointreau, chamomile-infused honey syrup, fresh lemon juice, egg white, garnished with dried chamomile flowers. This winning cocktail will be served in select bars at Caesars Palace throughout the rest of the year. On Saturday, Aug. 6, Caesars Palace continued to commemorate its rich history of world-class entertainment and iconic sporting events and stunts with a red carpet arrival and Grand Gala event for nearly 3,000 invited VIP guests. Donning an Antonio Berardi outfit, Planet Hollywood Resort & Casino headliner Jennifer Lopez made a surprise appearance during the opening of the gala among a flash mob led by showgirls and a full orchestra and wished the legendary resort happy 50th anniversary. Tony Bennett, who was the second performer to ever appear at the Circus Maximus Showroom in 1966 and in 1969 was the first and only entertainer ever offered a lifetime contract to perform at the trailblazing resort, headlined the extravagant evening and received a Caesars Palace Icon Award. Comedian and actor Howie Mandel, who previously appeared at the original Circus Maximus showroom and served as Master of Ceremonies for Caesars Palace 30th Anniversary television special in 1996, hosted the evening's festivities. Mandel also brought out a giant birthday cake to celebrate Bennett's 90th birthday at the gala. During the opening musical number, Caesars Entertainment headliners Wayne Newton, Donny and Marie Osmond, and Matt Goss performed "Viva Las Vegas" on stage together, while The Righteous Brothers performed "Time of Your Life" and "You Lost That Lovin' Feeling" later that night. A cappella group MO5AIC (Mosaic), winners of "MTV's Top Pop Group" and semi-finalists on "America's Got Talent," performed a medley of headliner songs throughout Caesars Palace's history as well. Throughout the evening, Caesars Palace recognized iconic individuals who have made significant contributions to its colorful history and shaped the enduring legacy of the world-renowned resort. The Jay Sarno Family, who showcased a display of personal memorabilia during evening, received the Founder's Icon Award. International Boxing Hall of Famer Thomas "Hitman" Hearns presented an Icon Award to Rasheda Ali in honor of her father, Muhammad Ali. Additional recipients of the Icon Award included: OMNIA Nightclub headliner Calvin Harris, Gordon Ramsay, the Knievel Family, Larry Ruvo and Caesars Palace President Gary Selesner, as well as The Colosseum at Caesars Palace headliners Celine Dion, Elton John and Jerry Seinfeld through acceptance speech videos. As part of the ongoing Summer of Caesars celebration, the iconic resort is also continuing to offer a free, self-guided walking photo tour and exhibit highlighting the most memorable moments and people in the rich history of Caesars Palace available through the end of August. From bringing the biggest names in entertainment including legendary singer Celine Dion to offering an unmatched collection of celebrity chefs to serving as home to top sporting events and daredevil stunts, Caesars Palace has become synonymous with Las Vegas itself. As the resort reflects on its many milestones and memories, Caesars Palace continues to reinvent and re-imagine. For more information, visit caesars.com/CP50. To download historical images and full press kit, click here. 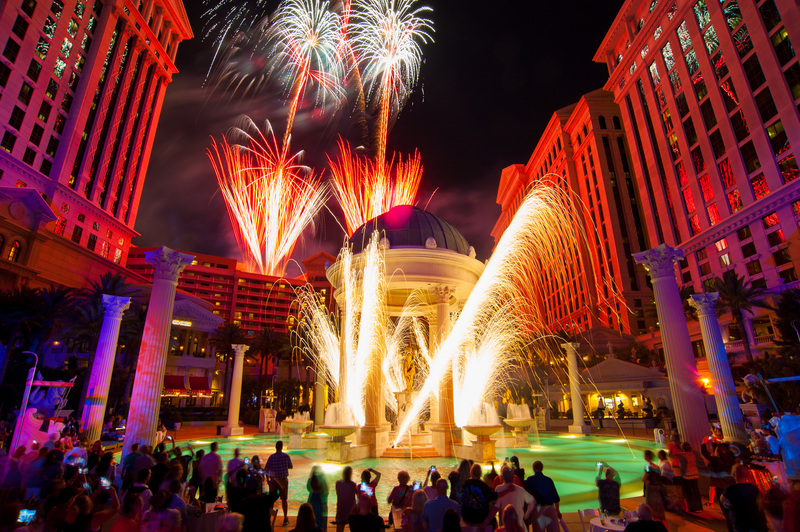 For more photos of the Caesars Palace Anniversary weekend click here. World-renowned Las Vegas resort and casino and voted "Best Strip Hotel" in 2015 by the readers of the Las Vegas Review-Journal, Caesars Palace features 3,980 hotel guest rooms and suites, including the all-new Julius Tower, the 181-room Nobu Hotel Caesars Palace and Forbes Star Award-winning The Laurel Collection by Caesars Palace. Celebrating its 50th anniversary in 2016, the 85-acre resort offers 25 diverse dining options including the award-winning Bacchanal Buffet, as well as celebrity chef-branded restaurants by Gordon Ramsay, Bobby Flay, Nobu Matsuhisa, Guy Savoy and MR CHOW. The all-new Montecristo Cigar Bar is now open and pairs notable cigar offerings with fine whiskeys, small bites and more. The resort also features nearly 130,000 square feet of casino space, a five-acre Garden of the Gods pool oasis, the luxurious Qua Baths & Spa, COLOR Salon by celebrity hairstylist Michael Boychuck, five wedding chapels and gardens, and the new 75,000-square-foot OMNIA Nightclub with the top DJs such as Calvin Harris, Martin Garrix and Steve Angello. The 4,300-seat Colosseum, Billboard Magazine's Venue of the Decade, spotlights world-class entertainers including Celine Dion, Elton John, Rod Stewart, Reba, Brooks & Dunn, Mariah Carey and Jerry Seinfeld. The Forum Shops at Caesars showcases more than 160 boutiques and restaurants. For more information, please visit caesarspalace.com. Find Caesars Palace on Facebook and follow on Twitter and Instagram.